On 5 June 1918 disaffected Afrikaners were brought together in a new organisation called Jong Suid-Afrika (Young South Africa). The following year its name was changed to the Afrikaner Broederbond (AB). The organisation had one main aim: to further Afrikaner nationalism in South Africa - to maintain Afrikaner culture, develop an Afrikaner economy, and to gain control of the South African government. 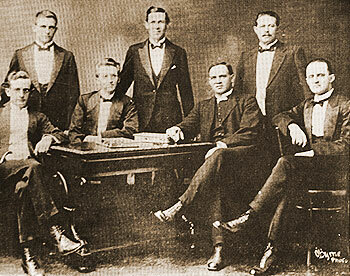 During the 1930s the Afrikaner Broederbond became increasingly political, creating several public front organisations - especially the Federasie van Afrikaanse Kultuurvereniginge (FAK - Federation of Afrikaans Cultural Societies) which acted as an umbrella organisation for Afrikaner cultural groups, and took over the original cultural remit of the AB. The Afrikaner Broederbond, meanwhile, evolved into a highly influential 'secret' society. Its political influence became apparent in 1934 when JBM Hertzog merged the National Party (NP) with Jan Smuts' South African Party (SAP), to form the United Party (UP). Radical members of the NP broke away from the 'fusion government' to form the Herenigde Nasionale Party (HNP - 'Reunited National Party') under the leadership of DF Malan. The AB threw its full support behind the HNP, and its members dominated the new party - especially in the Afrikaner strongholds of Transvaal and Orange Free State. The South African prime minister, JBM Hertzog, declared in November 1935 that "there is no doubt that the secret Broederbond is nothing more than the HNP operating secretly underground, and the HNP is nothing more than the secret Afrikaner Broederbond operating in public." At the end of 1938, with centenary celebrations for the Great Trek, Afrikaner nationalism became increasingly popular, and additional organisations developed - almost all linked to the AB. Of particular significance were the Reddingdaadbond, which aimed to uplift (economically) the poor white Afrikaner, and the Ossewabrandwag, which started off as a 'cultural crusade' and rapidly developed into a paramilitary strikeforce. Afrikaner Broederbond. He resigned due to ill health at the end of 1940. Throughout the war support for the HNP increased and the influence of the Afrikaner Broederbond spread. By 1947 the AB had control of the South African Bureau of Racial Affairs (SABRA), and it was within this select group that the concept of total segregation for South Africa was developed. Changes were made to electoral boundaries, with constituencies favouring rural areas - with the result that although the United Party received a greater share of the votes in 1948, the HNP (with the assistance of the Afrikaner Party) had the greater number of electoral constituencies, and hence gained power. Every prime minister and state president in South Africa from 1948 to the end of Apartheid in 1994 was a member of the Afrikaner Broederbond. Once [the HNP was] in power...English-speaking bureaucrats, soldiers, and state employees were sidelined by reliable Afrikaners, with key posts going to Broederbond members (with their ideological commitment to separatism). The electoral system itself was manipulated to reduce the impact of immigrant English speakers and eliminate that of Coloureds. The Afrikaner Broederbond continued to act in secret, infiltrating and gaining control of the few organisations, such as the South African Agricultural Union (SAAU), which had political power and were opposed to a further escalation of Apartheid policies. Although revelations in the press, in the 1960s, about Afrikaner Broederbond membership began to erode its political power, influential Afrikaners continued to be members. Even at the end of the Apartheid era, just prior to the 1994 elections, most members of the departing white parliament were members of the AB (including almost all of the National Party cabinet). In 1993 the Afrikaner Broederbond decided to end the secrecy and under its new name, Afrikanerbond, opened membership to women and other races.